Back in the day, I used my paycheck to buy the top-notch MP3 player that was the Rio500. Unfortunately, I forgot it in the back pocket on my plane seat when flying over to Raleigh for my Red Hat induction. And then I used one of my first new job paycheck to buy a second generation (and very very expensive) iPod. You could say that hacking on Walk500, a front-end to that great player is the reason why I'm hacking on GNOME these days. I couldn't bear the thought anymore, and bought a Rio500 on eBay for $5. Hacking on it half-an-hour at a time, I cleaned up the code. The latest release of the modern era is available on SourceForge. To bad the rio500 driver was removed from the Fedora kernel in rawide a few weeks ago then. David, certainly not. You got that the wrong way around. I asked for the rio500 driver to be removed, so we could use the device without any problems from user-space. In that case, I will go look for my rio500 usb cable and get testing.. I wonder if this thing still works, it's been lying in a drawer for 4-5 years now. Packages are now available in Mandriva Cooker, 2008 Spring and 2008 (in /contrib/backports for the stable releases). 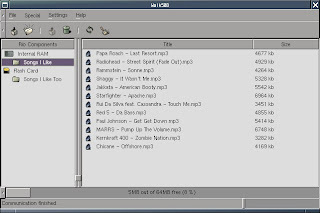 Note that the fonts included have been ripped out and replaced with fonts from wine and console-fonts, as the ones included in rio500 are not freely licensed.